How about a film about the existential conundrum of religious faith? It’s a funny kind of a way to express one’s love for a property and its characters; spending a disproportionate amount of time on wholly new ones. True, a series shouldn’t stay still, or rest on its laurels, but if the innovation lacks any of the flair and that made it so good in the first place it would be better not to bother. 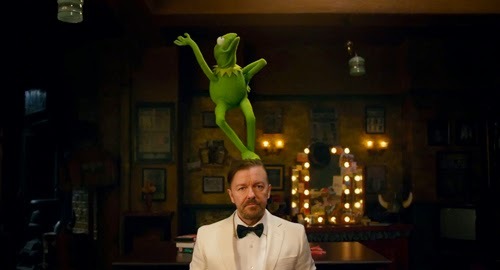 Acknowledging this, as Muppets Most Wanted sort of does several times, can only do so much to affirm the self-referential wit for which the series is famous; it’s only clever to say you’re crappy if you’re actually not. This seventh (theatrical) sequel undoubtedly has its moments, but in many respects it perpetuates the problems of its predecessor rather than remedying them. Writer-director James Bobin (and co-writer Nicholas Stoller) they immediately face up to the task in hand with the We’re Doing a Sequel song (“It looks like they’ve ordered a sequel, and everybody knows that the sequel’s not quite as good”). But the essential starting point in counteracting this would have been to get rid of Walter, introduced via the last picture’s banal conceit of a character that wanted to join the Muppets. 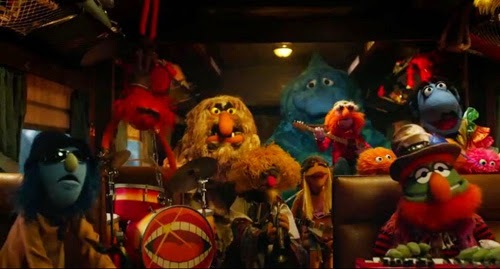 Bobin and Stoller probably didn’t want to admit they got it wrong, so again this dullest of felt fellows eats up screen time that should have been reserved for the many more vibrant players in the Muppet-verse. And again, at one point they very nearly acknowledge that they spent a whole movie getting him to join up, “Maybe even at the expense of other long-standing beloved Muppets”, as Rizzo opines (exit scene right with Robin). That Walter is ever-present suggests bloody-mindedness on the parts of Bobin and Stoller, however. The plot they come up with this time isn’t necessarily so bad, except we’ve already had The Great Mupper Caper; criminals hijack the Muppet European Tour in order to perpetrate a series of heists. This fosters a brace of cameos and different destinations. 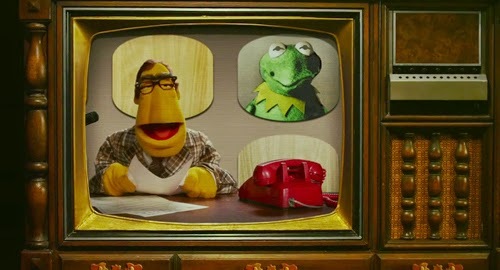 Unfortunately, both new characters (human and muppet) fail to capture the lunacy of the series at its best. 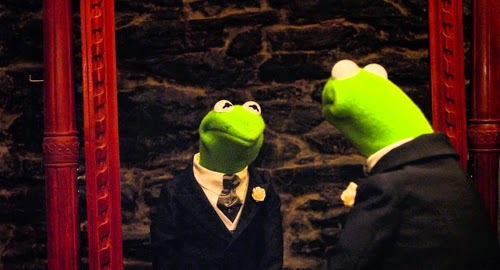 Much play is made of how no one notices Kermit’s replacement, despite a completely incongruous accent, and such obvious repetitions are Muppet bread-and-butter. But the evil frog fizzles as a character so his interaction with the other Muppets is a one-joke affair that isn’t especially amusing. 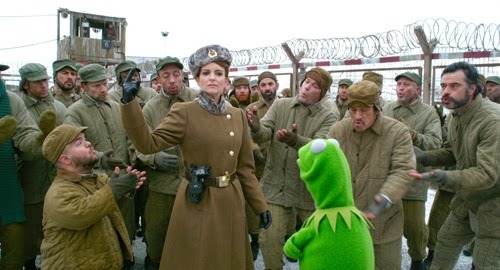 Kermit fares better in the gulag, with a game Tina Fey as the warden besotted with him and a selection of amusing inmates. There’s Danny Trejo (as Danny Trejo, which given that he really has been inside is particularly on-the-nose) singing (Bret McKenzie’s songs are yet again one of the highlights, although the best track is a cover of Working in a Coal Mine, and fellow Conchord Jermaine Clement perfectly fits into the Muppet world as the Prison King) and Ray Liotta delivery some classic Liotta deadpan. Rowlf: (Reading the German sign) Die Muppets? Waldorf: I can’t believe the reviews are out so early. Statler: Maybe that’s the suggestion box. 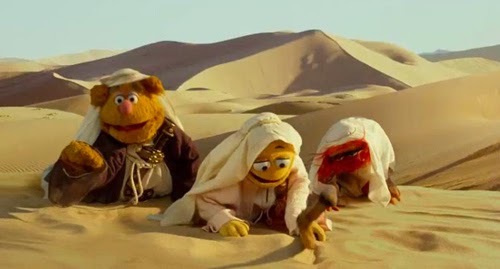 Muppet movies are never easy to pull off; their magic is best engineered in TV sketch format, or playing off a recognisable story (Christmas Carol and Treasure Island both work reasonably well). Statler and Waldorf barely get a look in, the same with Gonzo. There’s also an unconvincing moral about cuddly values (“We’re a family”). 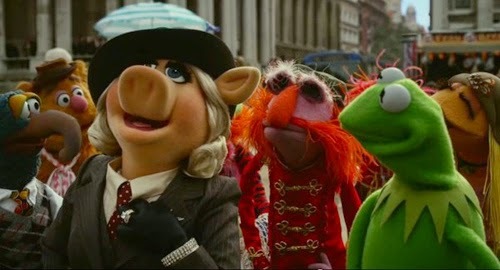 Muppets Most Wanted is well shot, I’ll give it that, but it’s a “That’ll do” affair, much the way Fierce Creatures wasn’t a worthy re-assemblage of the Wanda team. The new characters are duff (they would have been better off featuring ‘80s Robot prominently instead of Walter, if they had to bring back a new character, but he’s consigned to extra status) and the plot is determinedly unadventurous. 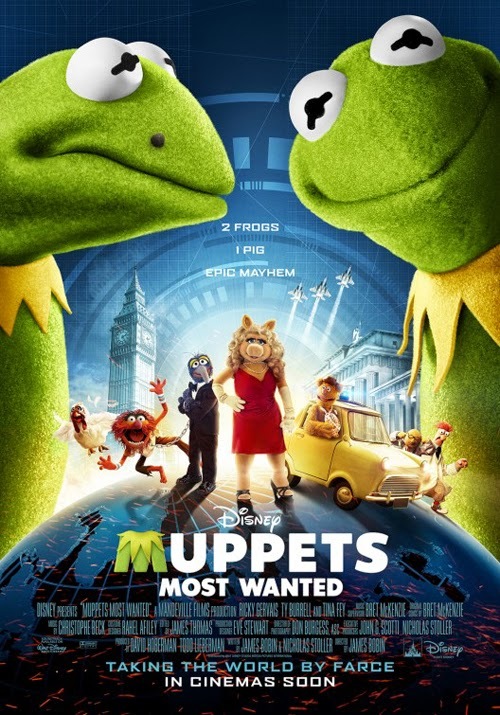 Most Wanted made less than half as much money as its predecessor, which in part suggests The Muppets itself wasn’t up to scratch (nostalgia sold tickets as much as anything) but it’s also indicative of word of mouth. I can’t lay all the blame Gervais, although he’s a blight on any motion picture; Stoller and Bobin’s contributions are persistently patchy. 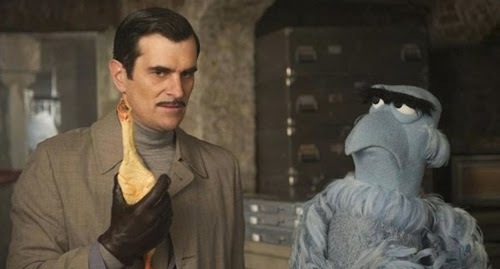 If the rest of the picture were as inspired as the Sam/Burrell scenes, though, this would have been top tier Muppet moviedom.